In South Boston, there were three distinct groups of socially vulnerable populations: people with disabilities who had limited English proficiency and less than a high school education (r ≥ 0.789, P < 0.01); female older adults with a medical illness that rent (r ≥ 0.771, P < 0.01); and people who have limited English proficiency, less than a high school education, and no vehicle (r ≥ 0.783, P < 0.01). 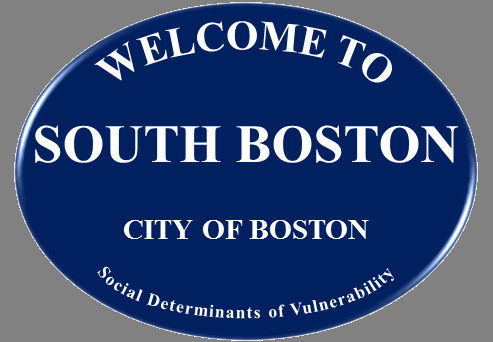 Socially vulnerable groups occur in smaller numbers in South Boston compared to other areas of the city. South Boston had the second smallest population of people of color and relatively smaller percentages of people with disabilities, children, older adults, low-to-no income, limited English proficiency, and people with less than a high school education.